Laue's original theory of X-ray diffraction was characterized in Ch. 6 as a kinematical theory. Just as in mechanics the sub-section of kinematics deals with the analysis and superposition of given motions, regardless of any forces producing them, so this theory only considers the result of superposing given elementary wavelets which are derived from an incident or primary wave by its successive scattering on the atoms. No further scattering is considered which the secondary rays might produce on their passage through the crystal, and the omission of this reaction entails immediately an infringement of the law of conservation of energy. Each secondary ray, generated by 'constructive interference' of the wavelets, transports energy in its own direction, and this energy flow must obviously be taken out of that of the primary ray. On the assumption of the kinematical theory, however, the strength of the primary ray is not affected by the scattering, so that energy is not withdrawn from that source. For this reason it cannot be expected that the kinematical theory renders correct account of the intensities to be found in the secondary rays. This deficiency of the kinematical theory was not apparent from Laue's first experiments, because the primary beam seemed to have such an overwhelmingly large intensity. With a scattering action weak of the first order, the reaction via the primary beam would be small of the second order, and indeed, the kinematical theory may be safely applied if, as in a fine powder, the individual crystal is so small that its total scattered intensity remains a very small fraction of the intensity incident on it. Only with the use of X-ray tubes giving strong monochromatic X-rays did it become certain that a diffracted (or 'reflected') ray was not as weak as it appeared to be from the Laue diagram. It was recognized that the central spot of these diagrams contains the entire spectrum of the incident radiation and that, referred to the same spectral range that is contained in the secondary ray, this and the primary ray are of similar intensity. Comparable intensity of incident and reflected ray is assumed in C. G. Darwin's very early dynamical theory (1914). Considering first a single plane of atoms, Darwin calculates a reflection coefficient for it by the classical considerations by which J. J. Thomson determined the scattering by a single electron. This reflection coefficient is then applied to the back and forth reflections of the two beams, primary and reflected, between the equally spaced atomic planes of the crystal. The theory has many points in common with that of light falling on a plane-parallel glass plate, for instance in the Lummer-Gehrcke interferometer. Its result is a curve for the reflected and transmitted amplitudes as functions of the angle of incidence on the crystal plate. In the symmetrical Bragg case, i.e. when the reflecting planes are parallel to the crystal surface, total reflection occurs over a small angular range of incidence of the order of 10 seconds of arc, next to the Bragg angle; here the crystal acts as a no-pass filter to the incident ray. In the adjoining angular regions the reflectivity drops rapidly to zero. The centre of the region is shifted slightly from the position indicated by Bragg's Law nλ = 2d sin θ as usually applied, namely by taking for λ the X-ray wave-length in free space, which we will now call λ0. Instead, λ should be understood as the wave-length in the crystal, that is λ0/μ, where μ is the refractive index for X-rays in the body. Normally, μ is smaller than 1, μ = 1 - ε, where ε is a positive quantity of the order of 10-6, so that the wavelength and phase velocity are greater in the body than in empty space by this amount. Measurable deviations from Bragg's Law result because the refractive index varies from one order to another; they were noticed when the spectroscopists derived different wave-lengths for the same line reflected in different orders by applying the uncorrected Bragg Law. In the symmetrical Laue case, i.e. when the reflecting planes are at right angles to the surface of the crystal plate, the primary and secondary ray emerge at the underside of the plate equally inclined. Again there exists an angular range of some seconds of arc in which reflection occurs; but instead of reflectivity 1 as in total reflection, the maximum cannot exceed 1/2 and occurs exactly under the uncorrected Bragg angle of incidence. Darwin's paper is a masterpiece of physical insight into what is essential for explaining the features of X-ray diffraction by perfect crystals, and all later work, experimental and theoretical, has vindicated it. It grew out of the reflection idea current in England in 1913/14 which was not fully accepted in Germany. It could not convince the German physicists for two reasons. Thinking in terms of diffraction rather than reflection, they were conscious of the fact that a single plane of atoms, owing to its periodic structure, would produce a whole pencil of cross-grating spectra besides the specular reflection which was exclusively taken into consideration by Darwin. The second reason was the fact that in the Laue arrangement, then currently used in Germany, the incidence was generally taken along a direction of symmetry and therefore not a single reflected beam but all the symmetrically related ones were produced simultaneously. Darwin's treatment was not at all well adapted to deal with this case. It thus came that Ewald developed a dynamical theory along more general lines without fully recognizing the significance of Darwin's work, except when in the last stage the results of both theories in the case of only two rays turned out to be the same. The construction of the directions of the 'strong' diffracted rays by means of the sphere of reflection shows that if this sphere passes through n points of the reciprocal lattice, nothing would be changed if each of these points in turn were assumed to be the origin of this lattice, and the wave-vector pointing to it were that of the primary ray. In other words, given the wave-length λ0 which determines the radius of the sphere of reflection, and the centre of the sphere at the 'tie-point' T, the n plane waves form an inseparable unit which we call the X-optical field. If for the moment we considered only one of the component waves of this field to travel through the crystal alone, it would, in doing so, promptly generate the other (n -1) waves. There is, at this stage, no meaning attached to considering one of them as the 'primary' wave. The problem then arises of setting up the condition for the entire X-optical field to travel through the crystal in a self-consistent way. This means that at any atom the field should produce a scattered wavelet of exactly the amplitude and phase that are needed in order to build up the field as a sum over all the wavelets. As a result of this fundamental condition the tie-point T cannot be chosen arbitrarily; it has to lie on a surface in reciprocal space, the 'Surface of Dispersion'. Its particular shape extends only through that very small region of this space where the n chosen waves remain the only strong component waves of the X-optical field. This condition is not critical in so far as, with the tie-point moving farther away, the interaction between some of the waves becomes so weak that it becomes unnecessary to take it into account. In some cases, however, a new 'strong' wave-component of the field might turn up which should be considered. Once a tie-point T is chosen within this region and on any part of the surface of dispersion, the wave-vectors which go from T to the n lattice points of the reciprocal lattice are precisely determined regarding both length and direction, and they change with a shift of T on the surface of dispersion. This means that for each dynamically possible position of T the component waves have well-determined directions and phase velocities or refractive indices, but there is not a refractive index of the medium which would determine the velocity of all the waves. - The surface of dispersion contains one further important information, namely the relative amplitudes of all the component waves of the field. These depend on the position of T; in fact, the amplitude of a component wave h is proportional to (Kh2 - ko2)-1, where Kh is its wave-vector T → h and ko the wave constant of the elementary wavelets. Since this amplitude is extremely sensitive to small changes in the length of Kh the restriction of T to the surface of dispersion is the means of adjusting the amplitudes of the component waves of the field so that it becomes self-consistent. It can be shown generally that in a region of reciprocal space giving rise to n strong waves the surface of dispersion consists of 2n sheets, the factor 2 corresponding to the transversality of the waves. Thus if for one wave-vector, say K1, the direction is prescribed, 2n different lengths of this vector are dynamically possible with tie-points T1 to T2n, whereas the wave-vectors leading to the other points of the reciprocal lattice have each not only 2n different lengths but also slightly different directions. The differences in length and directions are minute since the spread of the tie-points is over a distance about 10-5 to 10-6 of the length of the wave-vectors themselves, yet they are the all important feature because of the dependence of the amplitude ratios on the shifts of the tie-points. Needless to say, each possible field can be given an arbitrary overall amplitude attached to the corresponding tie-point. Fortunately the knowledge of the dynamically possible fields in the interior of the unbounded crystal - the 'meso-fields' - is sufficient for the construction of the dynamically balanced state of a crystal bounded by a plane surface on which the 'incident' wave falls. The way this comes about is the following. The field in the unbounded crystal, which is represented by the tie-point T, is the sum of the spherical wavelets issuing from the atoms or dipoles filling all space. If the summation is limited to the wavelets issuing from the lower half-space only (the 'half-crystal') the same field, - the meso-field - ,is again generated inside the crystal, but there are additional waves created both inside and outside it ('epi-waves'). This is a result only of breaking off the summation. All epiwaves have phase velocity c as in free space. The internal epiwaves stand in a very close relation to those mesowaves which move from the surface towards the interior of the halfcrystal; in fact, each of these mesowaves is accompanied by an epiwave of the same amplitude (but of opposite phase) and a direction differing only by a refractive correction corresponding to its phase velocity c or wave-vector of length ko. The relation of the external epiwaves is of the same kind with respect to those mesowaves which travel from the interior of the half-crystal towards its surface. These waves exist only outside the crystal, and they are there the continuation (except again for a slight refraction) of the mesowaves running up against the surface. Clearly the internal epiwaves, as well as the incident wave which has to be superimposed, disturb the self-consistent régime which found its expression in the surface of dispersion. The mere fact that these waves have free space velocity c in the interior of the body shows that they do not belong there. If their elimination could be achieved by the superposition of self-consistent fields of suitable strengths, then a dynamically balanced state would remain over throughout the crystal. This is exactly what can be achieved with 2n conditions of annihilation of unacceptable waves and 2n overall amplitudes that can be chosen for the wave-fields represented by the 2n tie-points. In this solution, in each of the main directions of diffraction h a bundle of waves progresses with very nearly equal wave-vectors T1h, T2h, . . T2nh. These lead to multiple beats between the constituent waves, the spatial period of the beats being determined by the differences T2 - T1, T3 - T1 , . . which are very small compared to the length of, say, K1 = T1O, so that the change of amplitude in any one of the directions of diffraction takes place slowly. Through these beats the energy flow is shifted from one direction of diffraction to the others, and possibly back again; for this reason this type of solution was called the pendulum type solution (Pendellösung). It will be noticed that the beat periods, which are given by the above differences T2-T1 etc. are the same for all orders of diffraction, i.e. for all values h. At the surface the energy flux has of course at first the direction of the incident wave and the diffracted waves moving towards the interior start with amplitude zero; they pick up amplitude as they advance into the interior, while the primary wave is diminished. The details of the energy transfer, the beat period, the maximum amplitude reached by each diffracted wave, and, in the case of a plane parallel crystal slab of thickness D, the distribution of amplitudes among the diffracted rays emerging from the plate - all this depends on the exact direction of the incident wave and its wave-length and can best be visualized with the help of the surface of dispersion. Before discussing the simplest applications of this theory, namely to the cases of a solitary ray and of a primary and one secondary ray, the form should be considered which Laue gave to this theory in 1931. The main innovation lies in the model of the crystal, which to Laue is a three-dimensionally periodic dielectric, i.e. locally polarizable, medium. Laue does not concentrate the polarizability at certain points of the cell, as was the case of the dipoles of Ewald's theory, but considers a continuous distribution. M. Kohler, in 1935, derived Laue's assumption by a perturbation method from a wavemechanical model of the crystal. Actually the models are not fundamentally different since Laue could assume the scattering power to be localized at certain points, or Ewald could fill the cell with a suitable distribution of dipoles which in the limit form a continuous distribution. The main difference then is one of technique: Laue makes use of the Fourier development of the dielectric constant from the start, whereas with Ewald this appears only at a later stage in form of the structure factor of the polarizability distribution in the cell. A difference of perhaps greater significance occurs when the 'half-crystal' is considered. Its surface is obtained in Laue's theory as a plane cutting through the continuous mass distribution, and boundary conditions are formulated which must be fulfilled at all points of this plane. In Ewald's half-crystal the surface plane is defined by the last point-atoms, but between them it has no physical reality. There is no 'boundary condition'; instead the condition of self-consistency holds at every atom, no matter how deep in the interior it is situated. Both theories seem to give the same results and the choice between them is a matter of liking. The first case, that of a solitary X-ray in the crystal, occurs if the sphere of reflection passes close to the origin of the reciprocal lattice only, without approaching any other lattice point (Fig.15-5(1)). In contrast to the assumption of the kinematical theory that the phase velocity is c (the value for free space), and the length of the wave-vector ko = ν/c, we have to allow the solitary wave to travel in the body with a different velocity, q, and wave-vector of length Ko = ν/q, which is determined by the polarizability of the medium. The 'surface of dispersion' for this solitary wave is then a sphere of radius Ko and is valid for all those directions of propagation of this ray for which no secondary rays are generated. Any point on this surface may be taken as tie-point T about which the sphere of reflection, of radius ko can be drawn. This no longer goes through the origin of the reciprocal lattice, but passes it at a distance ko - Ko which in general is of the order of 10-5ko, corresponding to a departure of the refractive index from 1 by about 10-5. Fig. 15-5(1). Reciprocal lattice and single ray. Only the origin (000) = 1 lies close to the sphere of reflection. The circle shown dotted in parts, of radius k0, would be the locus of the tie-point T according to the kinematical theory. The small length of the inner circle, of radius K0, is the surface of dispersion of the ray as long as it remains solitary. Consider now the case of two strong wave-components of the optical field. This happens in positions of the tie-point T which are approximately at distance ko also from a second point, h, of the reciprocal lattice. 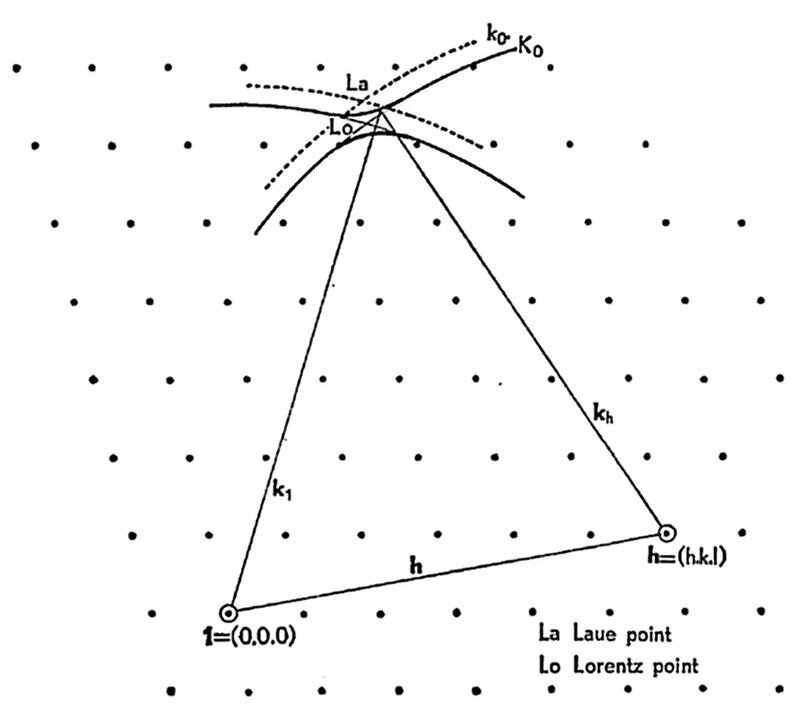 If we draw the surface of dispersion of radius Ko about h, as well as about the origin 1 (= 000), the point of intersection of the two spheres, in a given plane, is called the Lorentz point; it is that point where the two rays would co-exist except for their interaction. On account of the latter, however, the surfaces split up and are connected in a way that leaves the Lorentz point the centre but not a point of the surface of dispersion near this point. Fig. 15-5(2) shows the surface for one mode of polarization only, for instance when the electric vectors in both rays are normal to the plane of the rays. (When they lie in this plane, the splitting up of the surface would be slightly less.) 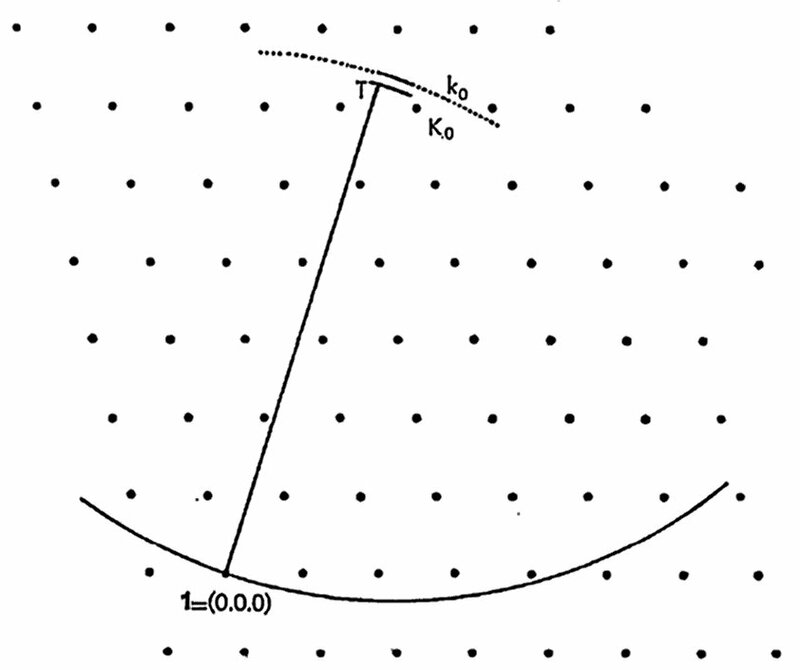 In the figure the splitting is shown on a highly magnified scale; actually the minimum distance of the two sheets should be only about 10-5 of the lengths of the wave-vectors K1 = T 1 and Kh = T h, respectively. The spheres of radius Ko are the asymptotic surfaces of the surface of dispersion. The drawing also shows the two (dotted) circles of radius ko about 1 and h which are the surfaces of dispersion of the solitary rays according to the kinematical theory. Their point of intersection is the 'Laue-point' with which the tie-point would have to coincide if the uncorrected Laue-Bragg conditions were to hold. The distance between the concentric circles about 1 or h, respectively, shows the normal effect of refraction, and the separation of the actual surface of dispersion from the two asymptotic circles is a measure of the interaction of the two rays. Fig. 15-5(2). Surface of dispersion for two rays. Dotted circles, radius k0: locus of tie-point for wave-vectors ending in reciprocal lattice points 1 and h according to the kinematical theory. Intersection at Laue point La. Drawn-out circles: same for dynamical theory assuming two uncoupled rays (radius K0). Intersection: Lorentz point Lo. The coupling of the two rays produces the splitting-up of the circles and interconnection as shown. This is the true surface of dispersion on which the tie-point has to lie. Shown for one case of polarisation only. N.B. In this and the preceding figure the difference between ko and Ko should be one part in 105 or 106, instead of one in twenty-five as drawn. The surface of dispersion fulfills the same function for X-rays which the 'normal surface' has for the crystal optics of visible light, namely that of containing the laws of wave-field propagation in the interior of the crystal and thereby offering an easily visualized means of constructing the field which will be generated inside and outside the half-crystal under the stimulus of an incident wave. Apart from the refraction, of interest for high-precision determinations of wave-lengths or lattice constants, the main application of the dynamical theory is to the discussion of the intensities of diffracted rays. 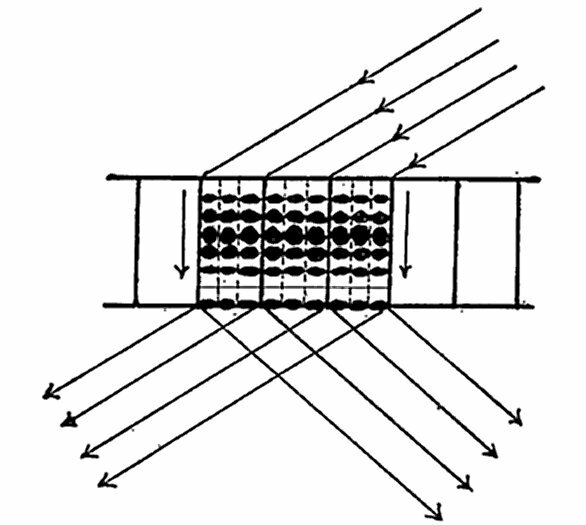 The usual test of the theory is performed on the symmetrically reflected ray with the reflecting atomic planes parallel to the crystal surface. In the ideal case of a simple lattice of non-absorbing point atoms, the reflection would be total within a certain angular range of incidence of the order of 5-10", and drop off quickly outside this range. The total, or integrated, intensity which is taken out of a beam of wider opening, or by turning the crystal through the reflecting position, is proportional to this angular range which varies with the angle of diffraction and is different for the two cases of polarization. The existence of a base in the cell makes the range of total reflection proportional to |Fh| not to |Fh|2 as in the kinematical theory. Absorption in the crystal modifies still further the expression for the integrated intensity. Within the resolving power of the experimental methods of Bergen Davis, Compton and Allison, Coster and Prins, L. Parratt, J. A. Bearden, M. Renninger and other specialists, the predictions of the dynamical theory concerning the range, shape and intensity of the reflection curve have been substantially confirmed on selected crystals. 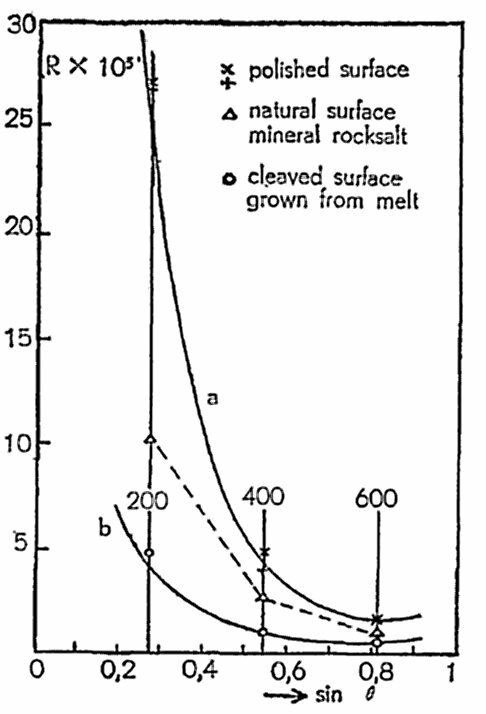 Renninger showed that even rocksalt, from which the standard data of mosaic crystal reflectivity were taken, gives rise to the totally different reflection curve of the perfect crystal provided only a few square millimeters of the cleaved surface of a crystal grown from the melt are used for the measurement. The curves showing the reflection for the perfect and the ideal mosaic crystal show the great increase in intensity of the mosaic crystal over the perfect one (Darwin's discovery), and the measured points show that either of these curves can be very closely approached, and that a crystal taken from a salt mine may give values anywhere between the two extremes (Fig. 15-6(1)). For this reason the accurate determination of Fourier coefficients from measured intensities requires a preceding study of the perfection of the individual crystals on which the measurements are being made. Fig. 15-6(1). Reflectivity of rocksalt for CuK-radiation. o crystal grown from melt, untouched cleavage, small area. After M. Renninger, Zs.f.Krist., A 1934, 99, pg. 368. The dynamical theory is also essential in accounting for the changes of intensity of a reflection of order h when there occurs, simultaneously, a reflection of order h' on a different set of planes. The first example on which this was studied was the 'forbidden' reflection 222 of diamond. The fact that this reflection was missing gave W. H. and W. L. Bragg the clue to the structure of diamond in 1913, but on close inspection a trace of the reflection was found. This pointed to the existence of a non-centrosymmetric carbon atom and the true intensity of this reflection thus became a means for studying the atomic shape. The values found by different observers, though all small, stood not in good agreement and Renninger, remeasuring them on a two-crystal spectrometer, found that the value is strongly changed by turning the crystal in its reflecting face under preservation of the Bragg angle. For different azimuths the intensity varied in the ratio of about 1 : 10, showing peaks at the angles where a simultaneous reflection occurred. The explanation is, that although no direct transfer of energy can take place from the primary beam to 222 because the structure factor is zero (or very small), the once diffracted beam h' will act like a second primary beam and give a diffraction peak in the direction of 222 which is now, however, of order (2 - h', 2 - k', 2 - l'), and therefore may have a non-zero structure factor. The appearance of diffracted intensity in a direction where it was normally not expected was easier to detect than the change of intensity produced by simultaneous reflection in cases of non-vanishing structure factors. But these have by now been quite often found and form one reason why the 'reliability index R' (see Chapter 7) cannot be reduced below a minimum value. A very remarkable confirmation and extension of the dynamical theory began in 1948 with the first observations by G. Borrmann of what is now called the Borrmann Effect. This is the surprising fact that an absorbing, near perfect crystal suddenly becomes transparent when a secondary ray is split off. The effect is very sensitive to imperfections and has been most successfully observed in selected germanium, silicon and calcite crystals. There remains, even in the position of greatest transparency, a considerable absorption, but the reduction of intensity is by many powers of ten less than that expected by applying the ordinary absorption coefficient which indeed may prevent any measurable penetration of the crystal by X-rays outside the Bragg reflection position. The angular opening of the transmitted ray is very small, and A. Authier in Paris, by placing a slit between two crystals showing the Borrmann effect, managed to isolate a monochromatic beam of an angular opening of l/50". The emerging beam is strongly polarized through the Borrmann effect, so that a pair of suitably cut germanium crystal plates has been used by H. Cole as a polarizer. M. v. Laue gave the surprising explanation of the effect by discussing the results given by the dynamical theory after the introduction of a complex dielectric constant; the real part of this gives the refraction, and its imaginary part absorption. It turns out that just as the normal refractive index of a solitary wave suffers changes when the coupling with another ray sets in, so also does the absorption index: that sheet of the surface of absorption which comes closest to the 'Laue point' (see above) gives rise to the greatest reduction of absorption, while on the sheets which are pushed away from the Laue point absorption is enhanced. In travelling through a thick crystal only the least absorbed field survives, and this is represented by the tie-points lying closest to the Laue point. In the case of two rays, and four sheets of the surface of dispersion, the closest approach occurs for that case of polarization where the coupling between the rays is strongest, that is when the electric vector is normal to the plane of the rays. This explains the polarizing action of the effect. Fig. 15-6(2). Schematic drawing of wave-field in Borrmann effect. Between the reflecting planes (vertical full lines) a standing-wave pattern is progressing downwards. The nodal lines between the atomic planes are shown dotted. The wave-field splits up at the exit surface. In analysing the field inside the crystal it is seen that at the peak position of transparency in the symmetrical Laue case it consists of a wave travelling downwards along the reflecting net planes of atoms while across these planes the field has a standing-wave character. The planes of the atomic lattice are interleaved by nodal planes of the field on which the electric vector is permanently zero in the optimum case, or else remains small. If the absorbing atoms, for instance the calcium atoms in calcite, lie on these planes they are permanently situated in zero, or small, electric field and no photoeffect or absorption happens. The remaining absorption, in the case of calcite, would be that of the CO3 groups, which is only a fraction of that of the heavy atoms. The study of the optical field in the Borrmann effect led Laue to investigate the energy flow. Since no energy can be transported across the nodal planes of the standing wave, the flow of energy takes places along the reflecting planes. It was shown experimentally by Borrmann that only at the exit surface of the crystal the two wave-components of the internal field separate. In a rather sophisticated way this result vindicates the early attempts of W. H. Bragg and J. Stark (see Ch. 5) to explain X-ray diffraction by the transportation of 'photons' in the pits of the crystal structure. The standing-wave field becomes less perfect, and moves relative to the net-planes if the angle of incidence is even slightly altered, and with this change absorption quickly sets in and renders the crystal opaque. Any internal irregularities of the crystal, such as dislocations, the internal stresses due to bending or temperature gradients, etc. locally destroy the transparency. On enlarged photographs of the transmitted or reflected beams the individual dislocations in carefully annealed Si and Ge crystal have been counted and their shapes reconstructed from the shadows they produce when reflection takes place on different planes. One of the most promising subjects of research is the influence the temperature motion of the atoms has on the Borrmann effect. That diffraction effects can be obtained with particle streams is due to the fact that particles of mass m, velocity v, and momentum p have to be associated with a wave of wave-length λ = h/p, where h is Planck's constant 6.62 × 10-27 erg sec. This relation between particle and wave was first used by L. de Broglie in 1924 to show that the wave associated with an electron travelling on the Bohr orbit in an atom would just fit on to the orbit with an integer number of wave-lengths. Out of this idea arose, in 1926, Schrödinger's theory of wave-mechanics. In 1925 W. Elsasser first pronounced the likelihood that a beam of electrons could suffer diffraction in a crystal similar to X-rays, provided it had a velocity producing a suitable wave-length for the crystal lattice. In 1936, four years after the discovery of the neutron by James Chadwick, Elsasser applied the same idea to neutrons and the first experiments for verifying it were made together with H. v. Halban and P. Preiswerk using a radium-beryllium neutron source. - Electron diffraction was first obtained independently by C. J. Davisson and L. H. Germer at the Bell Telephone Laboratories and by G. P. Thomson in England in 1927. Since the first demonstration of these effects, an enormous amount of technical development of the instrumentation, of highly successful research, and of theoretical advancement has taken place in both branches of particle diffraction. Both subjects, closely linked as they are to X-ray diffraction, would deserve full chapters in this book; they are mentioned here as a pro memoria rather than as an adequate treatment, and electron diffraction in particular as a subject requiring the dynamical theory in a much higher degree than X-rays. The construction of reactors towards the end of the last war provided neutron sources of incomparably greater strength than the radioactive ones used earlier. A neutron flux of 1013 to 1014 neutrons per square centimeter and second made possible all the experimental methods which had been developed for X-rays, although much larger crystals and counters had to be used because of the much smaller interaction of neutrons with matter than of X-rays (ten to twenty times smaller for 'thermal neutrons', that is those which have been slowed down, mainly by collisions with the hydrogen atoms in paraffin, to an average equivalent wave-length of about one Ångström). For electrons, on the other hand, the interaction with matter is so much stronger than for X-rays that the scattered amplitude for the same wave-length is greater by a factor of the order of 104. The 'optical density' (μ2 - 1), where μ is the refractive index, is therefore much larger for electrons than for X-rays, where it is of the order 10-4 to 10-6. For a solitary electron beam μ2 - 1 = φ/V, where φ is the average electrostatic potential in the crystal (perhaps 6 Volt) and V is the accelerating potential through which the electron gained its energy, namely about 130, 15000 and 40000 Volt for electrons of wavelengths 1, 0.1, and 0.06 Ångström, respectively. Thus the optical density for these three wave-lengths is of the order of 1/20, 1/2000, and 1/6000, respectively. As a consequence of this much stronger interaction the validity of the kinematical theory of diffraction ends much earlier than for X-rays, and the dynamical theory has to be applied. The low-energy electrons, like X-rays of long wave-lengths, are strongly absorbed and wave-lengths of 0.1 Å and below are preferred for electron diffraction, except in surface investigation. This leads to a larger radius of the sphere of reflection, and therefore in the interior of the crystal to an electron-optical field consisting of a great number of component waves of comparable strength, instead of two or three waves which suffice in most cases for the discussion of X-optical fields. The diffraction of electrons is caused by the periodic electric potential within the crystal. H. Bethe gave the theory in his thesis in 1927 by developing the potential in a Fourier series and expressing the results in terms of the Fourier coefficients - the same procedure which was followed by Laue in 1931 in his form of the X-ray theory. The main physical difference between the two cases lies in the atomic factors: electrons are scattered by the charges of the electrons and of the nucleus of each atom, whereas the nucleus does not scatter X-rays. In the neutron case, the scattering is an interaction between the two heavy particles, the neutron and the nucleus, and electrons play an indirect role by creating magnetic fields. Neutron scattering without change of wave-length ('classical scattering') consists of two parts: one is the short-range neutron-nucleus interaction and the other the result of the magnetic interaction of the neutron spin and the magnetic field of the atom which is due partly to the nuclear spin and partly to the orbital and spin moments of the electrons. It would lead too far to give a full account of these newer applications of the diffraction principles. In both cases the existence of the experimental and theoretical methods evolved for X-rays has cut the time of development down to a fraction of that spent on X-ray methods. On the other hand, the peculiar features of both new fields have stimulated new developments, especially in theory, from which in turn the X-ray case profits. Never before has the dynamical theory been discussed to such depth and detail as in the great spate of papers that has been coming in the last ten years from the Japanese school of electron diffraction which goes back to S. Kikuchi. At a recent international conference on electron diffraction in Kyoto (September 1961) it became evident that in Japan alone there must be more physicists familiar with this theory than in all other countries taken together. The theory was shown to be essential not only for diffraction experiments as such, but also for the full explanation of the intensity distribution in electron-microscopical images. Apart from Japan, this study has found a home also in Australia (Melbourne), where J. M. Cowley, in collaboration with A. F. Moodie, has developed a new theoretical approach which is often better suited to deal with the strong interaction and the many-wave fields in electron diffraction. Neutron diffraction opens up new means of crystal structure analysis because the scattering power of atoms for neutrons differs radically from the simpler distribution of atomic factors for X-rays which go roughly with the atomic number or weight. Thus hydrogen gives an amplitude of coherent neutron scattering of nearly the same size as potassium but of opposite phase, and deuterium scatters with nearly twice the amplitude and the same phase as potassium. This strong scattering makes the detection of the hydrogen positions easier with neutrons than with X-rays. In non-magnetic neutron diffraction there is furthermore no dependence of the scattered amplitude on the scattering angle such as leads in the X-ray case to the complication of the atomic form factor and the rapid decrease of intensity in higher orders of diffraction; the size of the nucleus is so small compared to the neutron wave-length that it acts as a true point-scatterer. Since isotopes may have entirely different scattering powers for neutrons (as hydrogen and deuterium) a new type of 'heavy atom method' for crystal structure analysis by the substitution of chemically identical atoms becomes possible. The greatest innovation due to neutron diffraction is, however, the intimate study of the repartition of the magnetic moments among the atoms of a crystal. It is possible to 'polarize' a neutron beam, that is, to give the spin of the neutrons a parallel orientation by reflection on a single magnetic crystal such as magnetite or an iron-cobalt alloy. Since the amplitude of the magnetic scattering by an atom depends on the angle between its spin or magnetic field and that of the neutron, it is possible to investigate the distribution of magnetic moments in a crystal diffracting the polarized beam of neutrons. This method has opened up a new vista in structure determination which now reaches one level deeper than the knowledge of atomic sites and of electron distribution. Charts have been obtained for the repartition of the unpaired electrons alone (those creating the magnetic field) and of atomic spins. The classical structure theory of Schoenflies and Fedorov has to be enlarged by the discussion of the possible repartition of equal particles carrying a vectorial or even higher order property besides the insignificant property of a scalar mass. A beginning of this was made by N.V. Belov with the study of black-and-white and coloured space groups, but much remains to be done. Apart from the 'coherent' scattering of electrons, neutrons and X-rays which leads to the formation of diffracted rays in sharply defined directions, there is also an 'incoherent' scattering in which part of the energy is transferred from the incident wave to the crystal where it augments the thermal elastic waves in which the thermal motion of the atoms resides. This incoherent scattering is not confined to the directions of the secondary rays but fills the intermediate directions with a continuous and generally not uniform background of scattered radiation. In the case of X-rays the individual collision (scattering) process between the (X-ray) photon and the (elastic wave) phonon transfers so little energy that the change of wave-length in the scattering process can be neglected. But owing to the large mass of the neutron a much greater energy is involved in the transfer, so that the change of wave-length becomes measurable and permits to sort the scattered neutrons according to their energy loss. This has become an important method for exploring the elastic spectrum of crystals, so fundamental for many of their properties and so hard to find by other methods.